This antibody recognises human XRCC1 (x-ray cross complementing factor -1), a base excision repair protein. Synthetic peptide (Human) conjugated to KLH - which represented aportion within the last 100 amino acids of the human X-ray Repair Cross Complementing Protein 1 (GenBank PID 11425942). Recently XRCC-1 has been shown to be physically associated with other DNA repair enzymes, including PARP, DNA ligase III and DNA polymerase beta. Antibodies were affinity purified using thepeptide immobilized on solid support. Antibody concentration was determined by extinction coefficient: absorbance at 280 nmof 1.4 equals 1.0 mg of IgG. Our Abpromise guarantee covers the use of ab9147 in the following tested applications. WB 1/1000 - 1/10000. Detects a band of approximately 90 kDa (predicted molecular weight: 70 kDa). Corrects defective DNA strand-break repair and sister chromatid exchange following treatment with ionizing radiation and alkylating agents. Phosphorylation of Ser-371 causes dimer dissociation. Phosphorylation by CK2 promotes interaction with APTX and APLF. Nucleus. Accumulates at sites of DNA damage. Lane 1 : Whole cell extract (50mcg) from mock treated HeLa cells. Lane 2 : Whole cell extract (50mcg) from siRNA treated HeLa cells. 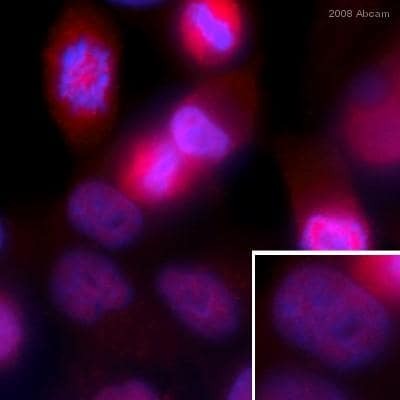 ab9147 staining human HeLa cells by ICC/IF. Cells were PFA fixed and permeabilized in 0.5% Triton X100 prior to blocking in 5% BSA for 30 minutes at 20°C. The primary antibody was diluted 1/200 and incubated with the sample for 1 hour at 20°C. 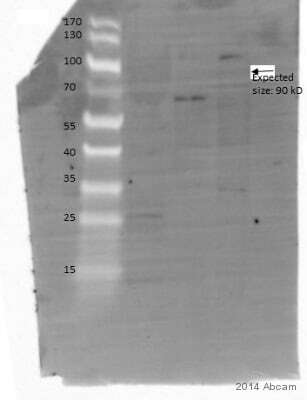 A Cy3® conjugated donkey anti-rabbit antibody diluted 1/400 was used as the secondary. Publishing research using ab9147? Please let us know so that we can cite the reference in this datasheet. Thank you for the details in which you have provided. Since you got absolutely no signal even with the HeLa nuclear extract (what is recommended as a positive control) it's definitely telling me that something is wrong with the batch/vial that you received. My suggestion would be to try increasing the concentration of the primary antibody, but since you're not even seeing any background I really don't think that would help. Anyway, I'm sending a replacement vial to you on order# 54735 and you should receive it tomorrow. Please let me know how it works out for you and if you have any further questions.